Inspired by my own losses, my animal sympathy cards fill a need for those who want to give and those who need to receive pet-appropriate images and sentiments that remember the joy of life with their animal companions. 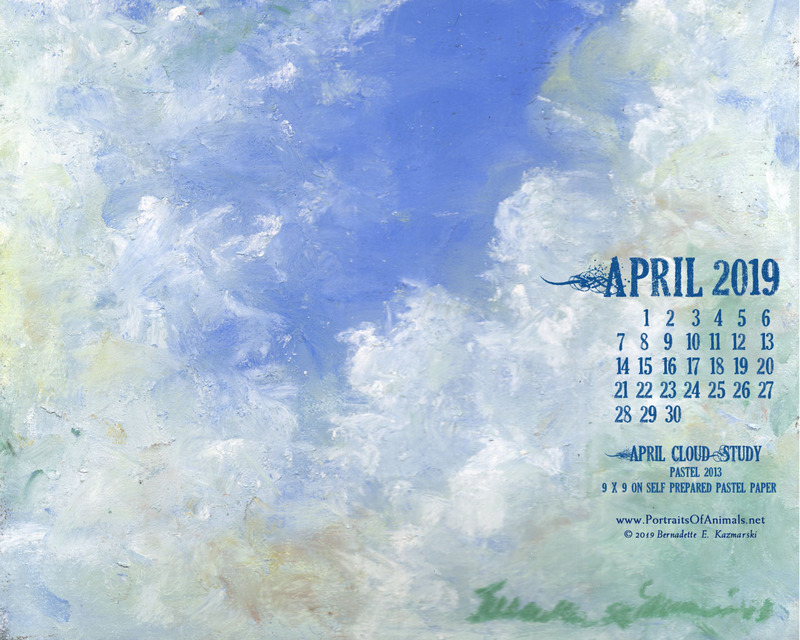 As an artist I turn my emotions into creative output. 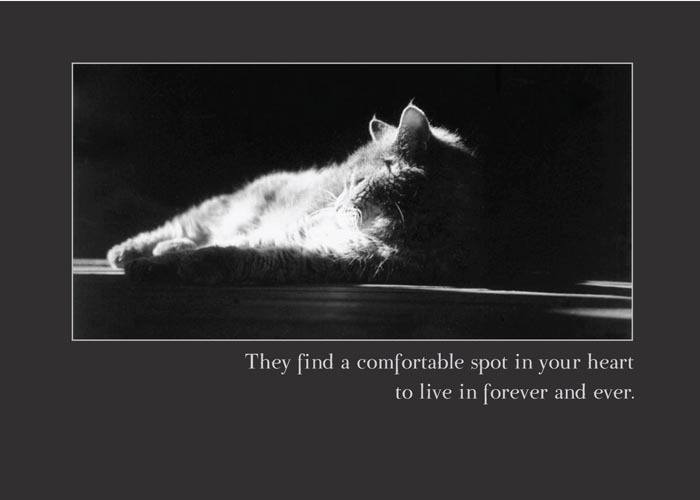 Thus it is with the grief I’ve felt at the losses of my cats through the years. 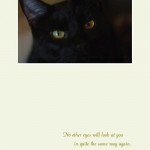 After receiving many sympathy cards I realized that not too many are focused on the loss of an animal companion, and I vowed to create a line of sympathy cards drawn on my own experiences that would feature photos and paintings of my cats and others’ animal companions as well as artwork and photos not focused on any species. 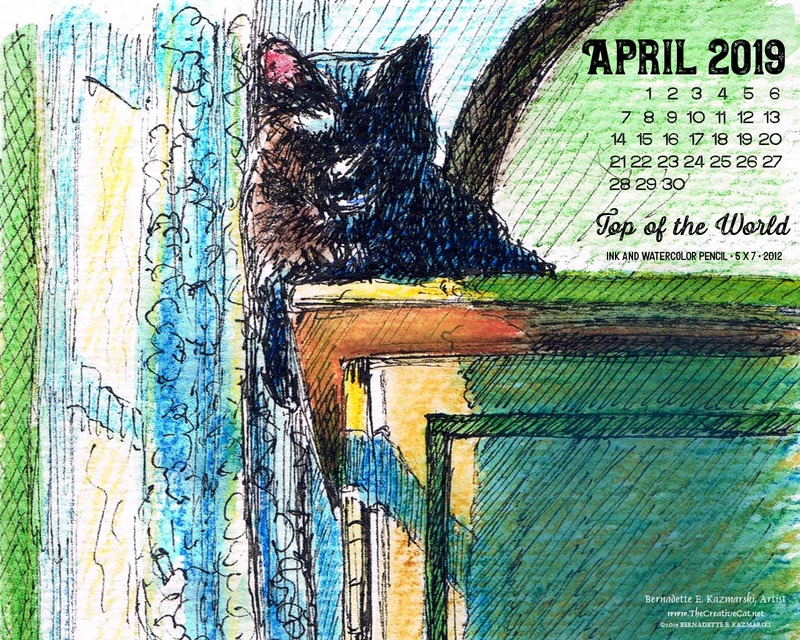 Each of the cats depicted here was or is one of mine and the dogs are ones I’ve come to know through friends and art customers. Most are feline cards because that’s the greatest amount of “material” I have, though I do have one canine card and two that could suit any animal. 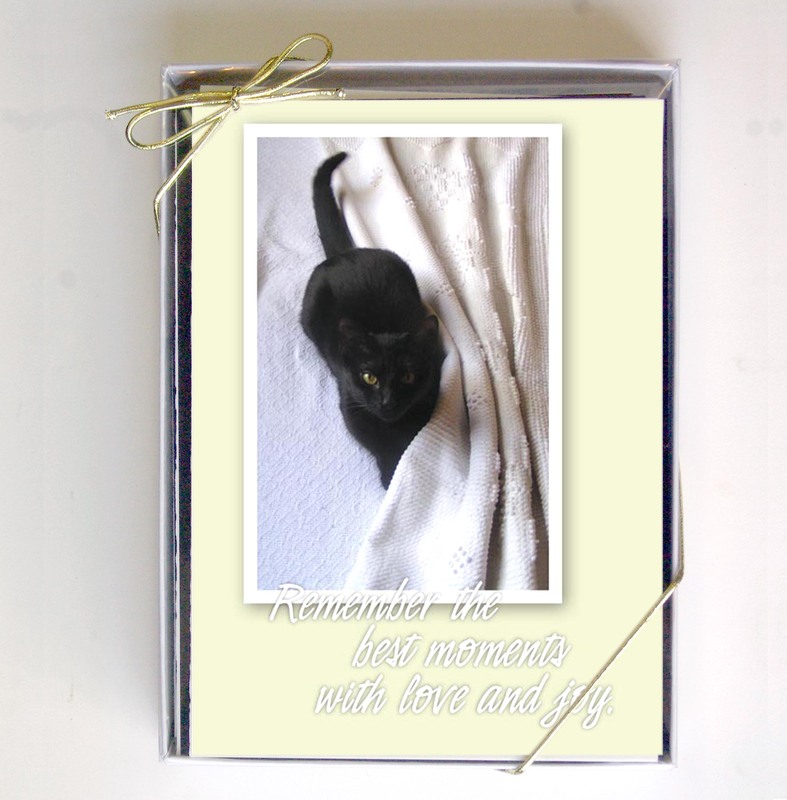 I take the use of an animal’s image in one of my designs very seriously and while I have many lovely photos and have been offered many more of other cats, of dogs and bunnies and ferrets, I feel I need to know my subjects before I use their image. My cats have no choice, especially “if they like to eat” as I always tell them when they roll their eyes about being my models. 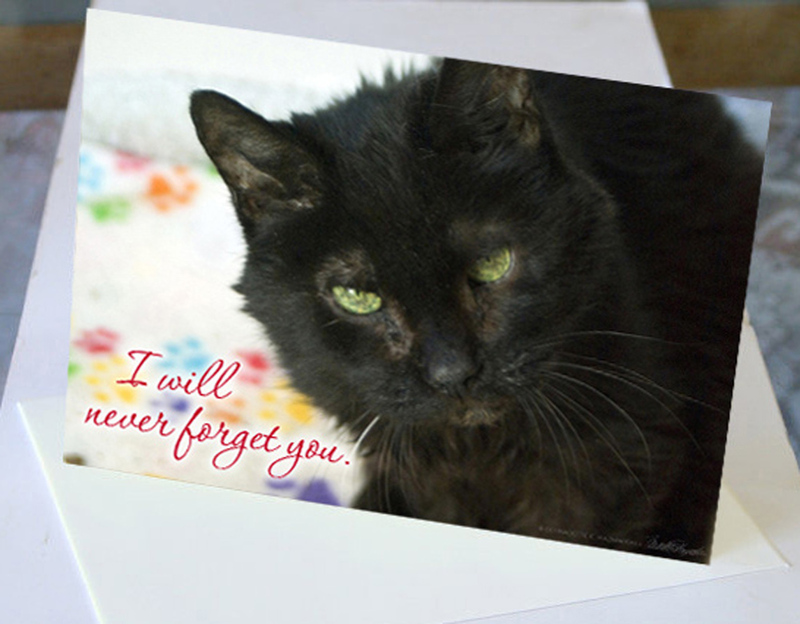 In the years since I’ve designed these cards I’ve designed several more dedicated to the geriatric and hospice foster cats I’ve had the joy of knowing, even for just a short time. 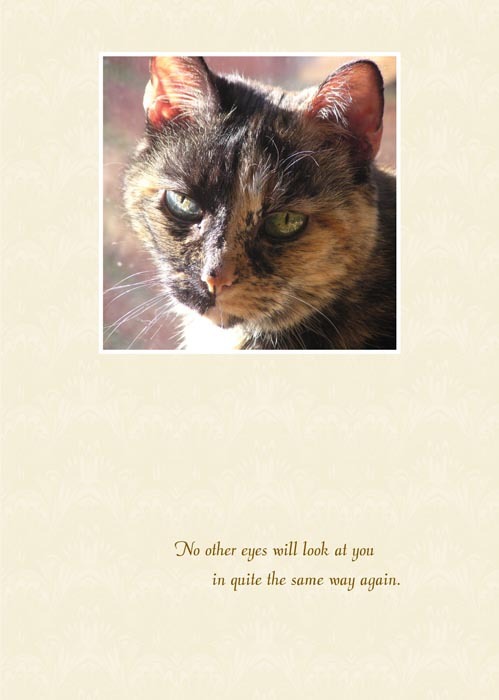 To read more about how these cards came to be and the remarkable cat whose loss inspired me to realize the dream of designing these cards, read “Animal Sympathy Cards” on The Creative Cat. 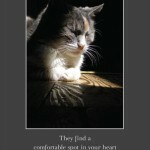 This line of sympathy cards for pet loss is 5″ x 7″ , printed on 14 pt. card stock and include a matching envelope, packed in a clear-top white cardboard greeting card box. 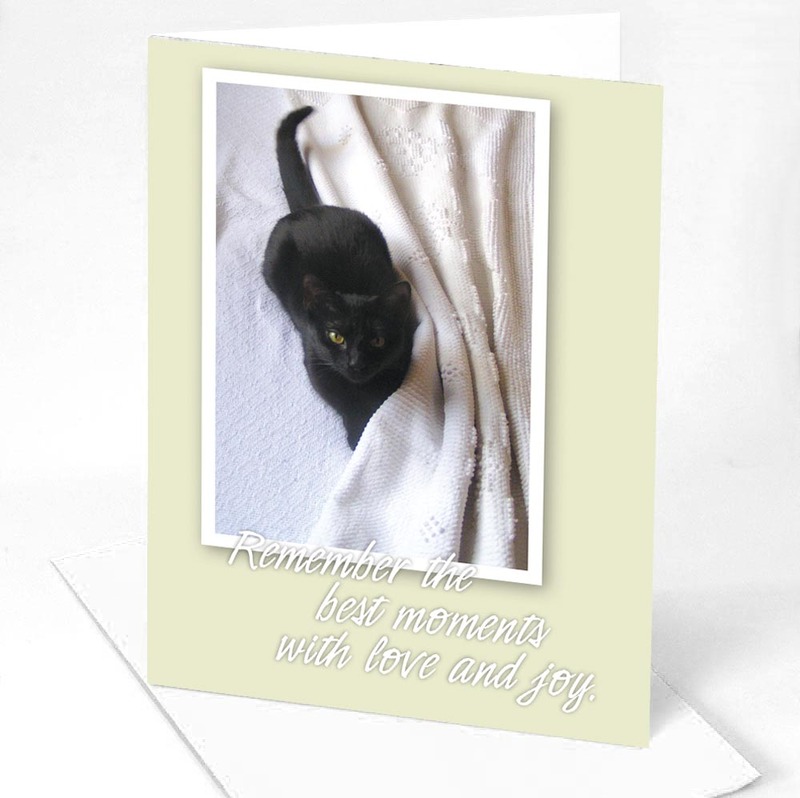 Cards are blank inside but can be customized with your message for an extra charge. 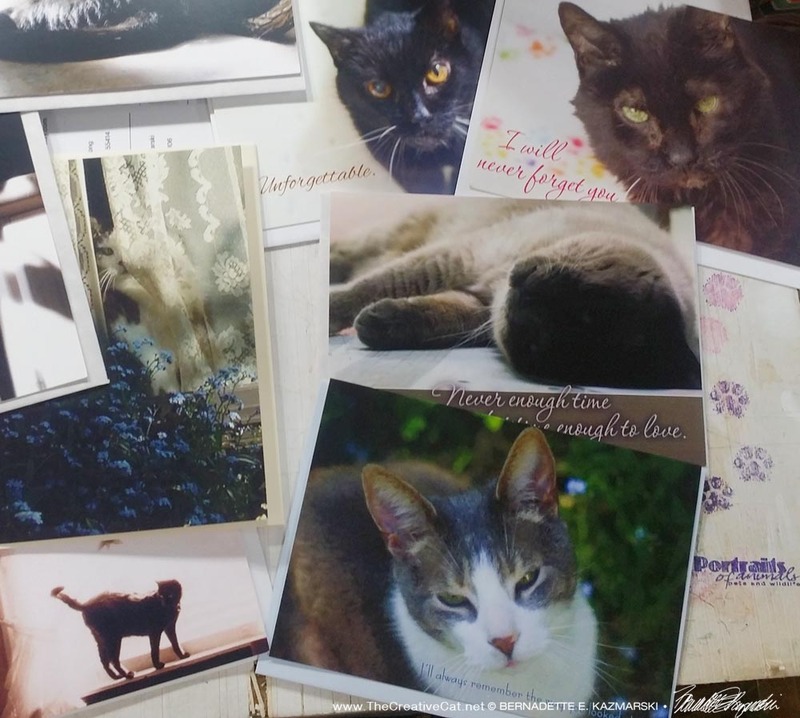 While these were created specifically for pet loss, customers have found that other of my cards serve to express sympathy as well, such as my Feline Fine Art Cards and the smaller sets of note cards. 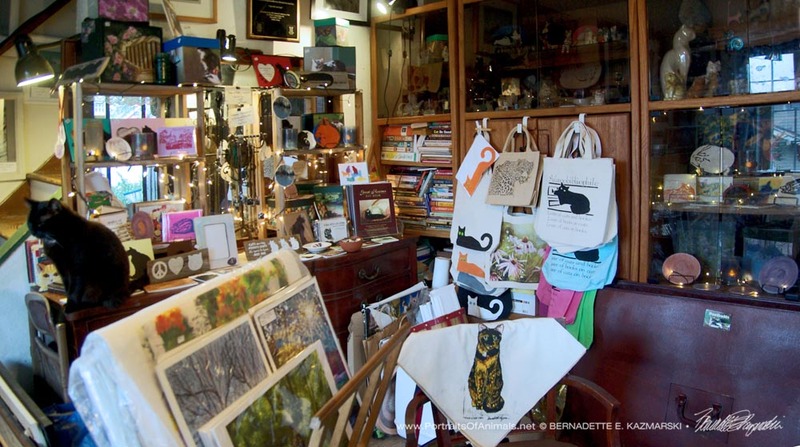 This will give you the dozen quantity price when purchasing your own selection of cards. 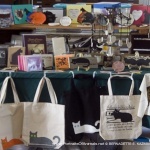 Use the box below to list the dozen designs you would like. 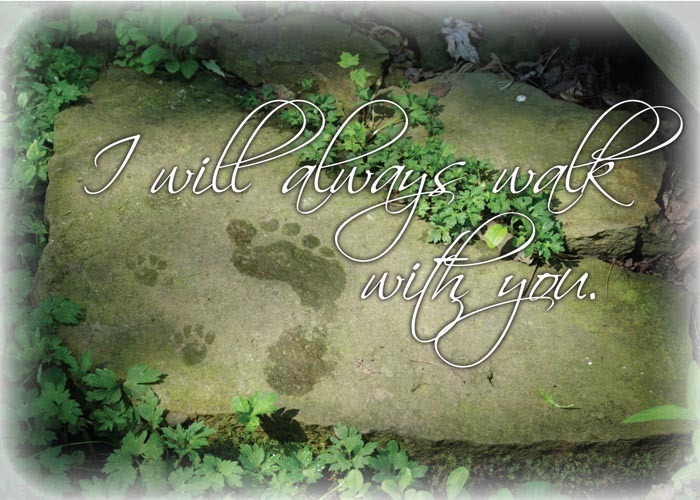 You aren’t constrained to only the designs below that are listed as sympathy cards, but you may choose from any of the 5 x 7 greeting cards on my site. If you have any questions, please ask. 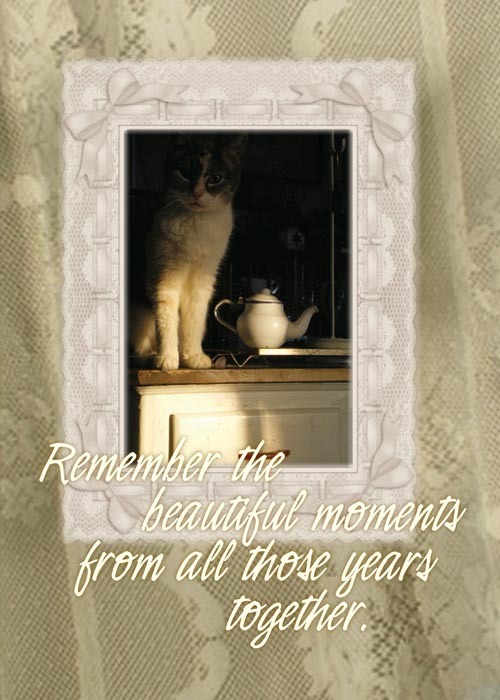 The sweetest memories often come in quiet moments. 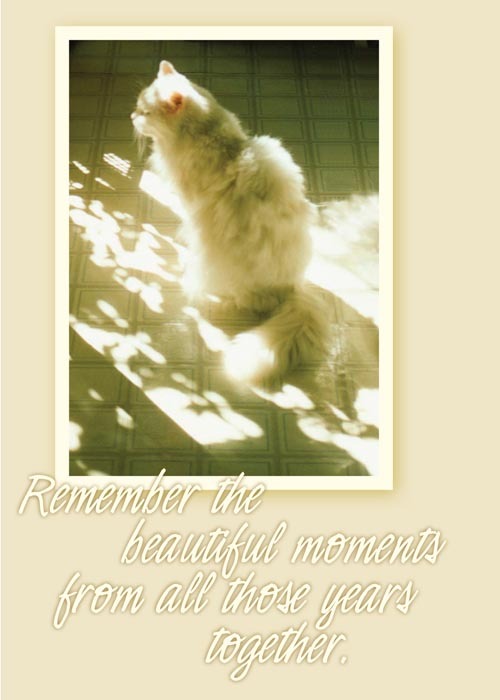 When I took this photo one autumn morning of Kelly in the long warm sun path from the back yard through door and across the mottled basement floor, though it was such a common event, I knew immediately this photo was special. 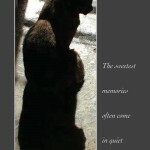 Timid rescued kitty Kelly could not pass up a chance to sit and be washed by comforting warmth, and while she often talked about things she liked she had settled and was quiet and contemplative in these moments. 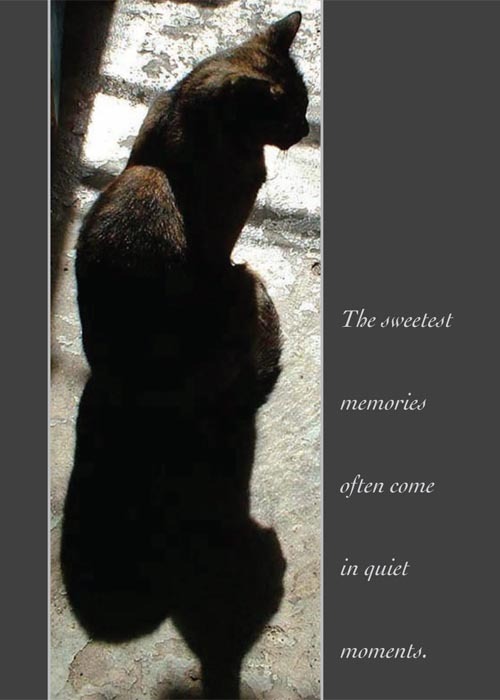 Although most of her body was in shadow leading off into her elongated shadow on the floor, I could see just enough of her tortie splashes on her silhouette to always know it was Kelly. and when she turned so I could capture her delicate profile, and curled her tail characteristically around her paws, I knew this photo, of all the ones I took in those moments, was going to “be something”. 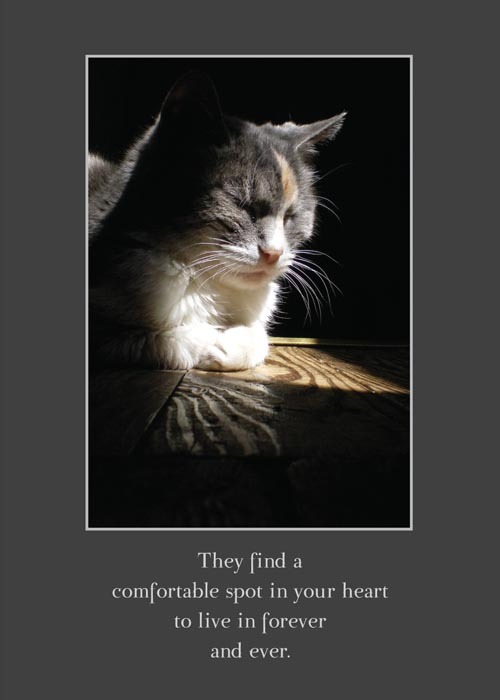 I recalled it years later when I began to design my animal sympathy cards and wrote the verse to accompany the image, knowing that someday I would look at that spot and remember that quiet moment with Kelly. 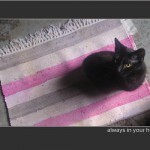 I do now, each warm sunny morning when we gather at the basement door to watch the nature and wildlife and enjoy one more temperate morning. 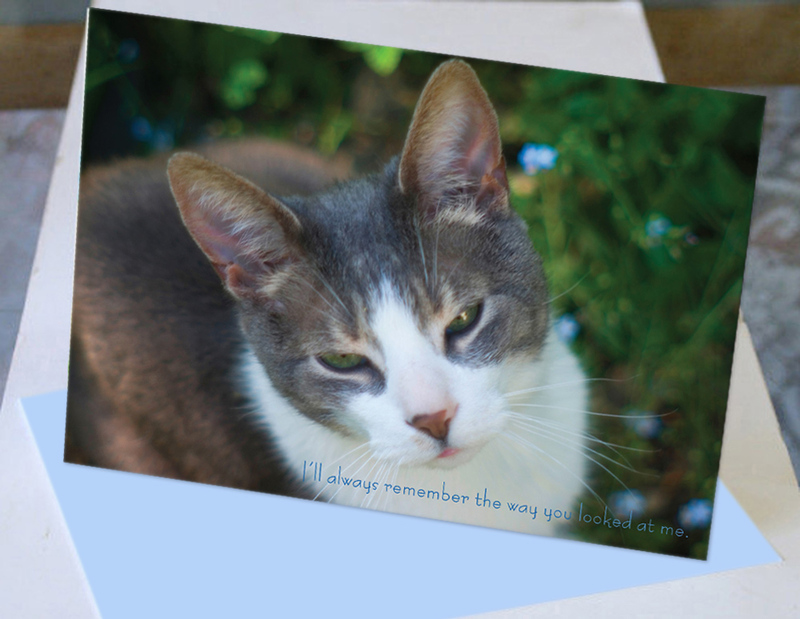 Sympathy cards assort with all other 5″ x 7″ greeting cards (except custom printed cards) for a quantity discount. 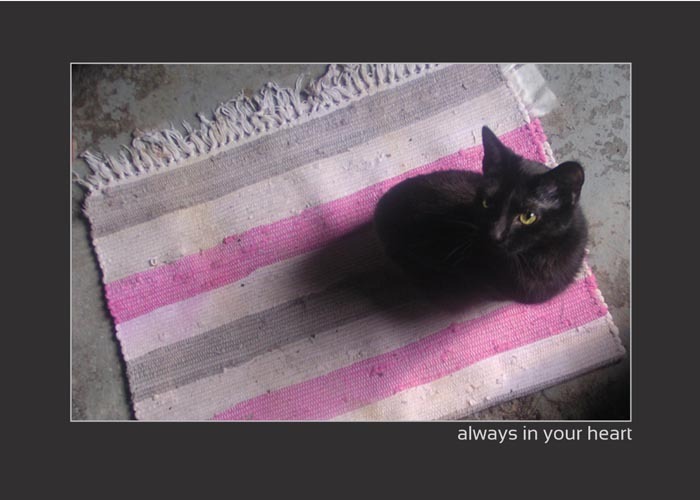 Visit my Animal Sympathy Cards page to see the entire set. 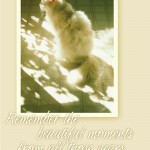 Remember the best moments with love and joy. 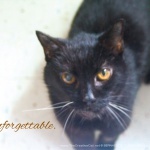 “Unforgettable” features Kennedy, a hospice rescue who was only with us for six weeks but somehow seemed like a brother to the family of four as soon as he came in the door. Those bristly whiskers and gaunt face, copper eyes with a cataract, bent legs, stiff spine, who could forget any of Kennedy’s battle scars? But mostly, who could forget the part that was just him: happy, full of love and friendship, despite his pain and his past as you clearly see in his eyes? 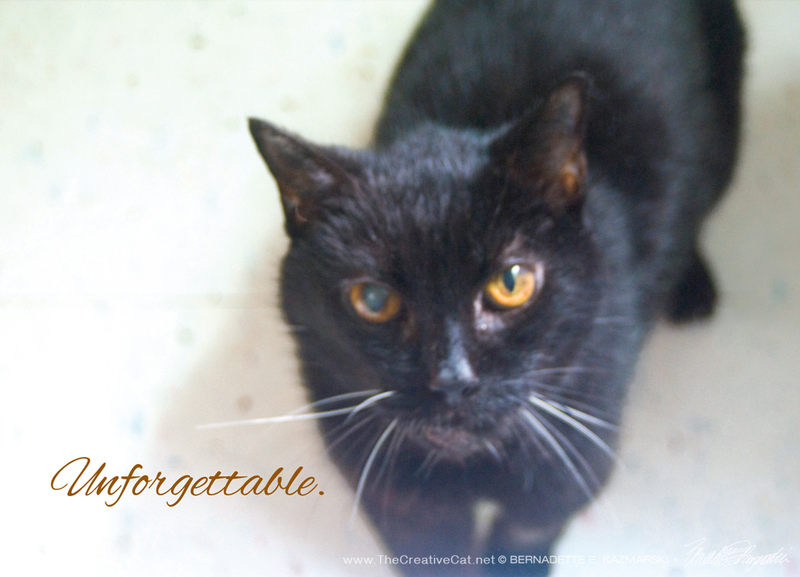 The photo is one of the very last I took of him while he still lived, taken on the morning of the day I had him put to sleep, looking at me with trust and love and understanding and all that experience written all over his face. 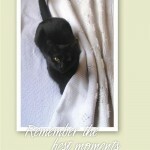 Read more about Kennedy on The Creative Cat. Price includes shipping via first class mail. 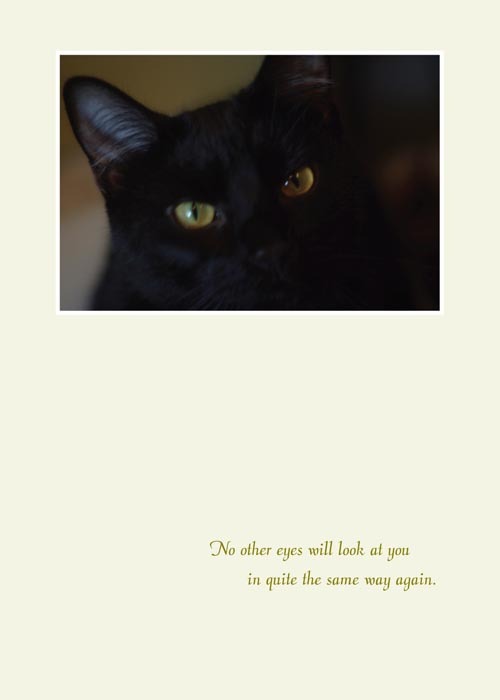 By ordering Animal Sympathy Cards, Custom Dozen, you can take advantage of the quantity discount for one, two three or four dozen cards and choose the images you are mostly likely to use. 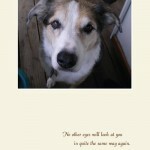 They assort with any 5″ x 7″ greeting card too, not just the designs included in the sympathy set. 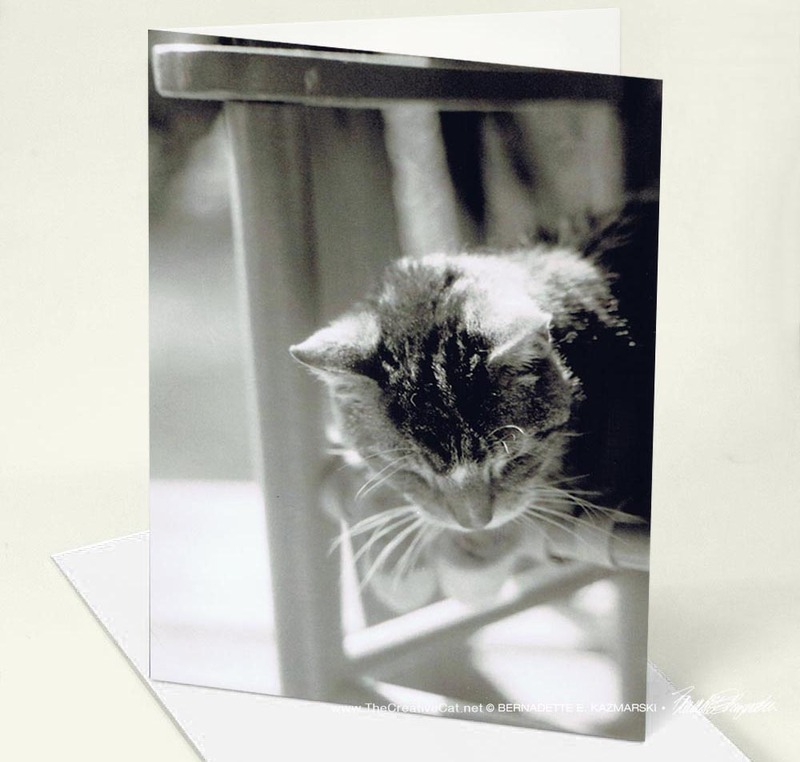 Sympathy cards assort with all other 5″ x 7″ greeting cards (except custom printed cards) for a quantity discount, including individual cards from other collections. 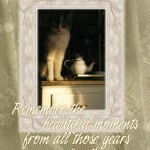 In the years since I’ve designed these cards I’ve designed several more. 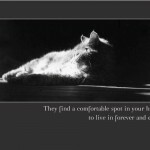 Some are new messages and images I want to share, some are dedicated to the geriatric and hospice foster cats I’ve had the joy of knowing, even for just a short time. To read more about how these cards came to be and the remarkable cat whose loss inspired me to realize the dream of designing these cards, read “Animal Sympathy Cards” on The Creative Cat. 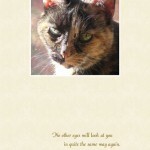 No other eyes will look at you in quite the same way again. 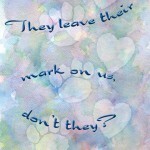 They leave their mark on us, don’t they? No text on the front. The forget-me-nots are beginning to bloom as they grow taller more quickly, an inch or two each day, in the pots in the windowbox under my dining room window. Each year when I transplant them from the yard and put the pots in place I remember Sophie and this particular beautiful moment in 2005—May 4, 2005 to be exact. It was Sophie’s year to pose in forget-me-nots and I have so many from the first two weeks of May, but of all of them, this is my favorite. And it’s not just a favorite of that series of Sophie in the forget-me-nots, but of all my photos to date, and a treasured memory. 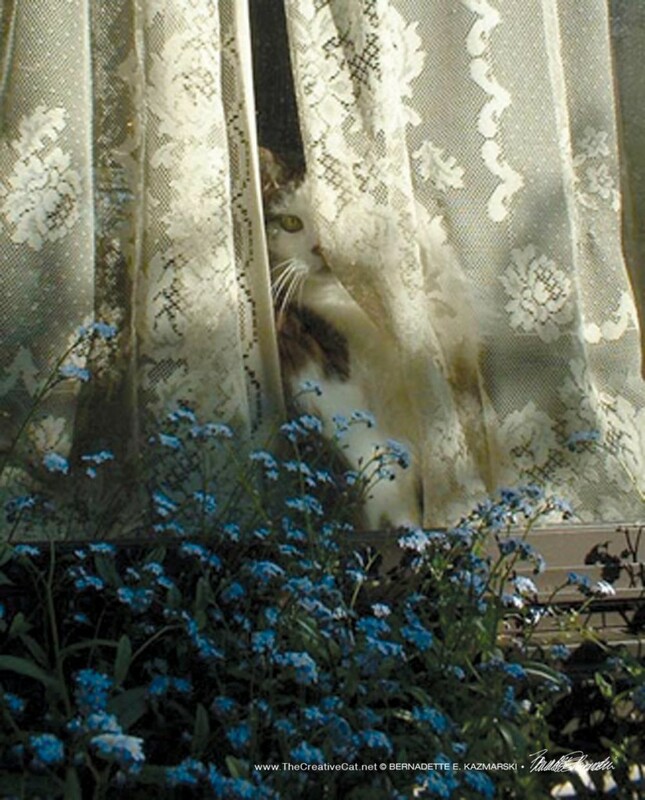 Sophie always watched me leave the house, and in the evenings I closed my curtains before I left. 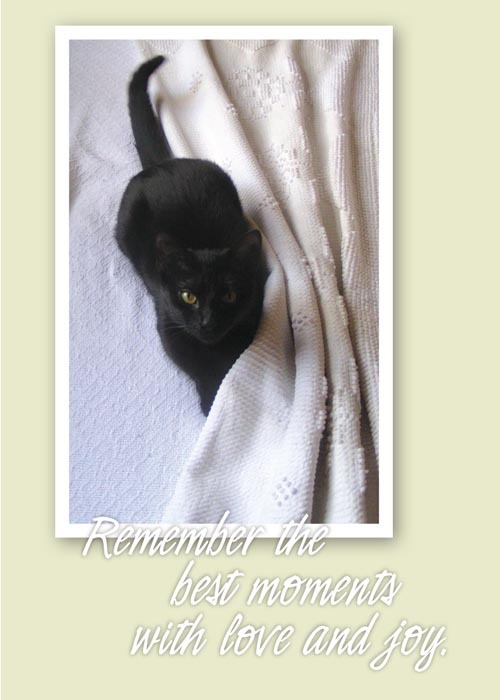 She also like to play around with the curtain—often I had to inspect the lace to see her white fur through the mesh, or she dramatically appeared from between the panels, around the edge or underneath, but she was always there with her big round eyes. 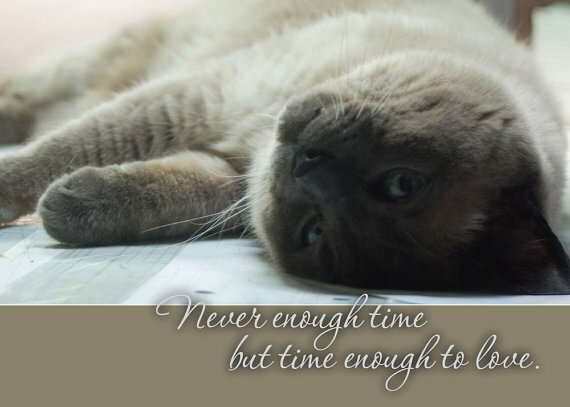 Never enough time, but time enough to love. 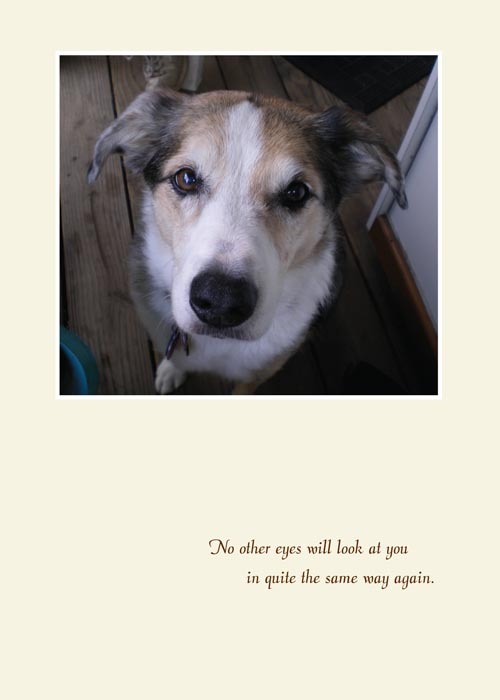 Ironically, I have also found that people use these cards for human sympathy or even for “thank you”, “thinking of you” and even romance, especially for those who share a love for animals. 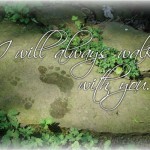 Loss is about love, and when I designed these I focused on that love instead of the pain of loss. 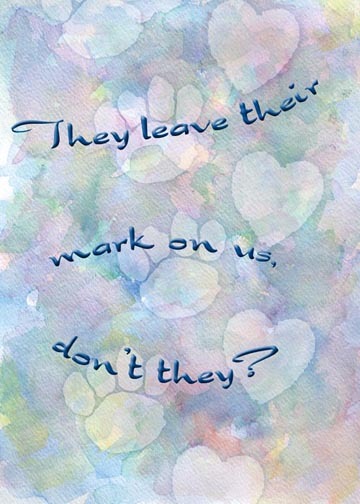 The galleries below link to the original set of sympathy cards, the newer cards I’ve designed and the other sets of cards others have chosen from for sympathy (please understand some areas and galleries are still “under construction). To now all but the fully handmade cards have been commercially printed, but with the introduction of this website I am offering custom printed cards—if one of my many cards isn’t quite what you’re looking for you can choose from a gallery of other likely images and have a custom single or quantity of cards printed just for you. 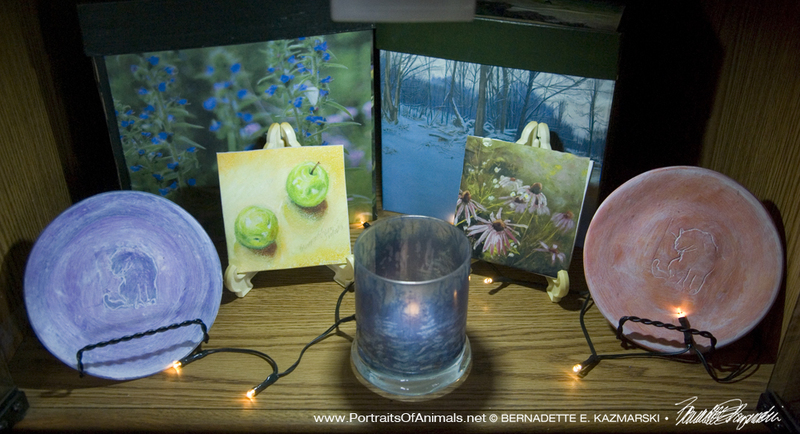 One of the ways I’ve chosen which cards to have printed as greeting card is to see if an image is popular, and I’ll have them printed so they are always available.